"[Insert quaint non-expletive exclamation], I didn't mean to take [Insert embarrassingly long span of time] between posts, but I've been busy with [Insert random life occurrences]!" I must try and break this habit. After this post. Wasn't that fun? Hmm, now my life looks more like a Mad Lib and less like blah blah blah boring stuff. Anyways, back to the sad truth about my head. It hates hats. Especially handknitted hats. I've knitted three hats for myself (including one while participating in the aforemetioned Jury Duty) and my head has rejected all three with such force of personality that the hats immediately defected to the oldest Kidling's head. 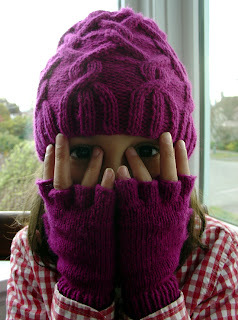 And here is another, modeled with some matching Knucks I made for the oldest kidling to match her father's. When I asked when she'd wear them, she said, "When I'm working on the scaffolding with Daddy." The hat is The Greenery Hat and lots of fun to knit. 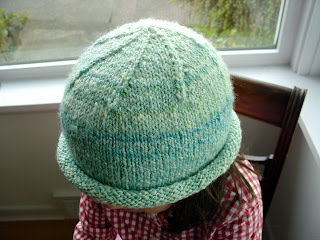 And, really, the hats look so cute on the kidling, I'm over being sad about my bulbous head.